The threat of Scripps Florida reveals a new tentacle, as the Hawkeye biotech development plans unfold before us. 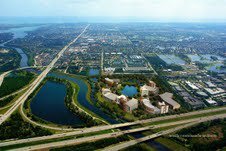 The Palm Beach County Commission is scheduled to make a final vote on the road expansion, which is needed for the development to move forward, on Tuesday, Oct. 16, 9:30am, at 301 North Olive Ave (6th Floor). Last week, the South Florida Times reported that dispute between a developer and residents of a historically black neighborhood in Jupiter has sparked a charge of environmental racism over a proposed new road—the southern extension of Island Way, off Indiantown Road. No one, thus far, has attempted to refute the charge of racism. But the attorney for the developer was arrogant enough to say residents are wrong in believing the road would run through their Limestone Creek community. A future image of the Hawkeye plan, this spot shown along the canal is currently quiet historic residential community, neighboring a forest full of biodiversity.